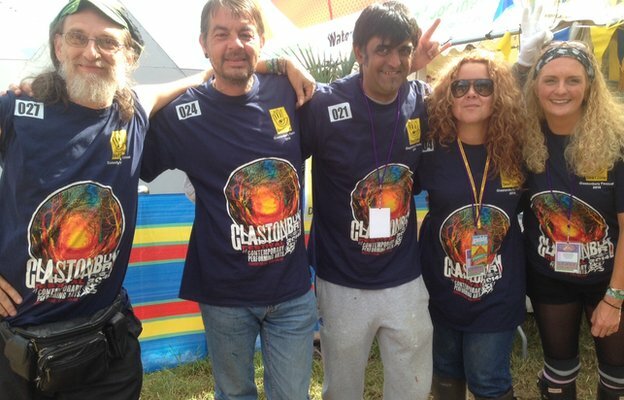 This year’s Glastonbury festival is the first ever to be awarded “gold” status by campaigners who want better access for deaf and disabled people at concerts and music venues. Festival organisers said the award was a sign of how “society is changing the way it thinks and acts towards disability”. The event has a bespoke campsite for deaf and disabled festival-goers, uses raised “viewing platforms” for wheelchair users at 11 stages and employs sign language interpreters to allow deaf people to understand lyrics during live acts. Gideon Feldman from the charity Attitude is Everything, which made the award earlier this year, says Glastonbury has taken disabled access “incredibly seriously”. But he said further improvements were still possible and warned that other UK entertainment venues could do more to support people with disabilities. “There is still a way to go – at the end of the day society is not equal,” he said. One of Glastonbury’s regular features is its DeafZone area, which offers lessons in British Sign Language and a team of interpreters for deaf people to access acts across the festival site. This year two sign language interpreters were used during Blondie’s performance on the Other Stage on Friday afternoon. Jo Stevens, a support worker for deaf people in Bath, has been working at the festival and says she has a hearing problem which means she struggles to understand lyrics in music. “I really like to be able to understand what is going on, what is happening,” says Ms Stevens. Glastonbury’s Spring Ground campsite this year hosted about 600 deaf and disabled festival-goers. The field includes accessible showers and toilets and is staffed by volunteers who provide wheelchair hire and a minibus service to help people move around the festival site. It also has a “high-dependency” unit which can give people with serious illnesses access to sterile toilet, washing and medical facilities. Student Vanessa Horath from Bristol works as a steward at Glastonbury and was concerned about getting in and out of the wheelchair she uses and into her tent. Heavy rain on Friday and Saturday brought mud to this year’s festival and the conditions can be challenging, she says. But she describes the assistance as “awesome”. “It’s amazing that they can make a farm accessible for a wheelchair and any other disabilities,” she adds. The biggest changes to accessibility for deaf and disabled people at Glastonbury have taken place over the past seven years. Claire Elsam, the festival’s access co-ordinator, says Glastonbury is working to make more progress but thinks it has helped “change attitudes” towards disability. “It amazes me that there are still venues that could quite easily be changed and still aren’t being changed,” she says. “Certainly when it comes to other festivals there are far smaller and easier sites that people can make accessible but they don’t necessarily do that. Campaigners acknowledge that cost is often a barrier to music venues becoming more accessible to disabled people. But Attitude is Everything argues that venues may be missing out on ticket sales, with four out of five deaf and disabled people saying they are put off going to events as they lack confidence in sites being accessible. Pudsey Bear pedals in support of Luke’s Rickshaw Challenge!